What an upgrade this is! The all new Rover Mini Rider now comes as a hydro static drive in a slight upgrade. For only an extra $400 your brand new machine is a simple forward and reverse peddle rather than the clutch and gear system employed on the cheaper one. 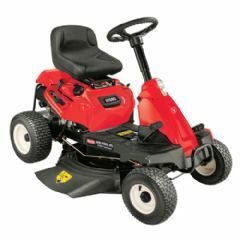 The 30" cut is perfect for smaller yards with this machine simple to operate and perfect for corner blocks or lawns that are just that little big for a push mower. With the optional mulching kit system also available this little mower really is a well rounded machine. Powered by a small, compact 382cc OHV Rover engine it has the perfect amount of power to get the job done. Also back by a 5 year warranty on both the unit and the engine you know your buying a machine that is designed to last the long run. This small ride on mower is perfect for blocks between 500 - 2000 square meters removing the hassle of having to push a lawn mower all day long! Because of the generous but not to big 30" deck you will still be able to fit the mower through most conventional gates and tighter areas on your property. By the length of the Flemington straight this is by far and away the best feature on this mower. The newly implemented addition removes the clutch system and replaces it with a simple foot operated pedal for forward and reverse. This features makes the machine a dream to operate in tighter areas giving the driver more control over the mowers actions.